A girl for all seasons: Ride 'em, cowboy. Our main reason for going to Calgary was of course, The Stampede! It boasts one of the world's largest rodeos, parades, side shows, chuck wagon races, concerts and First Nations expositions. 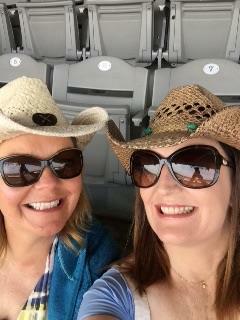 Our first purchase was the obligatory cowboy hat. The opening parade started. When last year's champions were "flown in", for some unknown reason Woody from Toystory came to mind! All I'll say is, the chances of you fathering children after a few years of doing this, must be greatly reduced! One item that I loved was the 50/50 raffle. This was where you could buy a ticket for the chance to win 50% of the gate's takings. On that day I could have won 40,000 CAD! I think it's something the GAA should consider for All-Ireland Final day. 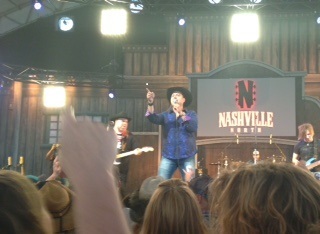 Afterwards we headed to the marque for Nashville North, for the authentic Country music experience. Later on, the singer Taylor Panczak announced that he was recording the video for his new song and would we help him out? Did someone say there was a camera? I was up as quick as a flash at the stage front, waving my arms and screaming like a hormonal teenager at a One Direction concert! Must keep an eye out on You Tube for my debut! I'm a natural. I can't wait for my Grammy! My sleepy eyes first read Granny! Which made me blink and see it correctly - yes of course you are a Star !